Home - Support us - Donate to the Royal Hospital for Neuro-disability - Our fundraising appeals - Do you like music? Stephen does. At 56 years old, Stephen had never had any problems with his nervous system. He led a healthy lifestyle and worked in a very senior role at the HM Treasury. But in April 2014 he caught a common cold which would change his life forever. He woke up in the morning feeling a bit groggy and by lunchtime he was unconscious. By the time he had regained consciousness, three months had passed and the first words he heard were you’re completely paralysed from the neck down. “It wasn’t the most comforting of things to hear”. He would later learn that he had contracted Guillain-Barré Syndrome, a rare but very serious condition which makes the body’s immune system attack part of its own nervous system. The exact cause is unknown but it usually follows a minor infection such as a cold or sore throat. By August 2014 Stephen was ready to begin the next stage of his treatment and he moved to the RHN for intensive therapy. Our team of specialists set about developing an individualised treatment plan and a big part of this was music therapy. Can you imagine losing one of the things that you most enjoy in life? Recently, they’ve been spending more time on the piano which really helps with fine motor skills – the type that Stephen needs in his job when he uses a computer. Jodie has worked with Stephen to set personal goals. It is clear that his self-esteem and confidence has greatly improved and this has helped his ability to face other challenges in his rehabilitation. Stephen is due to leave the RHN at the end of March. But there are other patients arriving soon at the RHN who vitally need music therapy too. 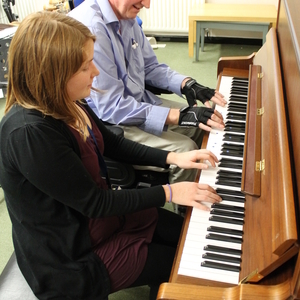 The music therapy department relies entirely on voluntary donations. You see, at the RHN we rely 100% on voluntary donations to keep our music therapy services going. We receive no Government or NHS funding for the department and yet, as you have seen, it is crucial for the rehabilitation of patients here. It is often the essential ingredient to getting patients back to living as independent as possible. A single music therapy session can cost as little as £27. My team and I want to help as many patients as we can, but without donations from generous people like you it can’t be done. Can you help support our music therapy sessions for other patients like Stephen? A gift from you today will help make sure that music therapy, provided by Jodie and others in my team can continue to provide hope and strength to other patients at the RHN. Thank you for being willing to support our important work – with your help we can provide a better quality of life for some of the UK’s most disabled people.